November 1, 2018, 2:19 PM · Welcome to "For the Record," Violinist.com's weekly roundup of new releases of recordings by violinists, violists, cellists and other classical musicians. We hope it helps you keep track of your favorite artists, as well as find some new ones to add to your listening! In celebration of its 70th anniversary, the Grammy Award-winning Juilliard String Quartet recorded Beethoven’s String Quartet in F Minor, Op. 95 "Serioso," Bartók’s String Quartet No. 1, Op. 7, Sz 40 and the world-premiere recording of "Fragments," String Quartet No. 6 by Pulitzer Prize-winning composer Mario Davidovsky. Note: The recording was made before violinist Areta Zhulla joined the quartet. 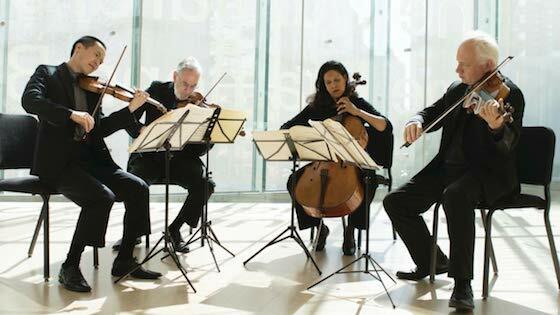 BELOW: Juilliard Quartet members talk about the group's 70th anniversary.